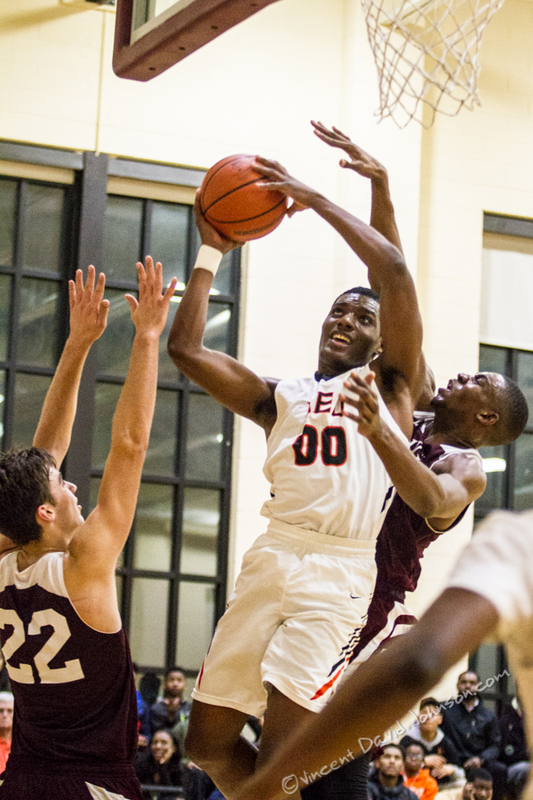 IHSA 2A Regional Final Turns Into Upset. It’s hard to score when all your shots are getting blocked. Brothers Jameel (left) and Mohammed Alausa (right) will probably set a blocked shot record for U-High and maybe the tournament. Friday, February 24, 2017 in Chicago. (Vincent D. Johnson-Chicago Tribune). For the second game in a row I’ve been pleasantly surprised with an exciting game when the Chicago Tribune/Daily Southtown sent me on assignment to cover Leo Catholic High School against University High Chicago in a 2A regional Final. 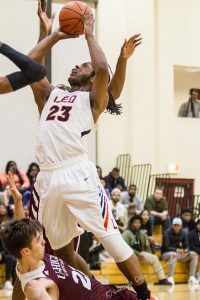 Leo, an always strong basketball school was the favorite as the number one seed on the 10 team regional and U-High was seeded fourth, but may have been overlooked being a school widely known for its academics. Either way it’s hard to score when all your shots are getting blocked. Brothers Jameel and Mohammed Alausa (photos above) will probably set a blocked shot record for U-High and maybe the tournament if they make a run into the sectionals. I counted at least 3-4 blocks for Jameel in this game alone and the IHSA’s website lists the 2A career tournament record at 13 and 9 for a single tournament. It’s not a surprise that as the season wears on for most high school sports that the games I see start to get better. As a former editor-in-chief I know picking the games to cover early in the season can be a crap shoot as you have little to go on past the result of the previous year and pre-season coach interviews end up being a mixed bag of not wanting to brag, or put a target on your back, to being a little unsure of your underclassmen’s talent level and possibly sandbagging it. Read the Daily Southtown story here. More images from the game can be seen here. Leo’s Dachaun Anderson drives to the hoop against U-High, Friday, February 24, 2017 in Chicago. (Vincent D. Johnson-Daily Southtown). 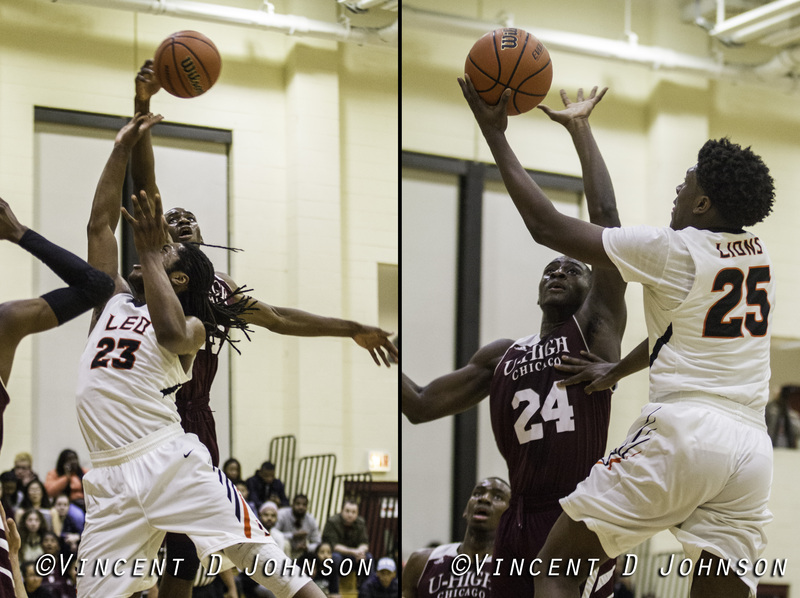 Leo’s Khalid Manney (00) tries to take a shot while being defended by U-High’s Oliver Maciak (22) and Jameel Alausa, Friday, February 24, 2017 in Chicago. (Vincent D. Johnson-Daily Southtown). 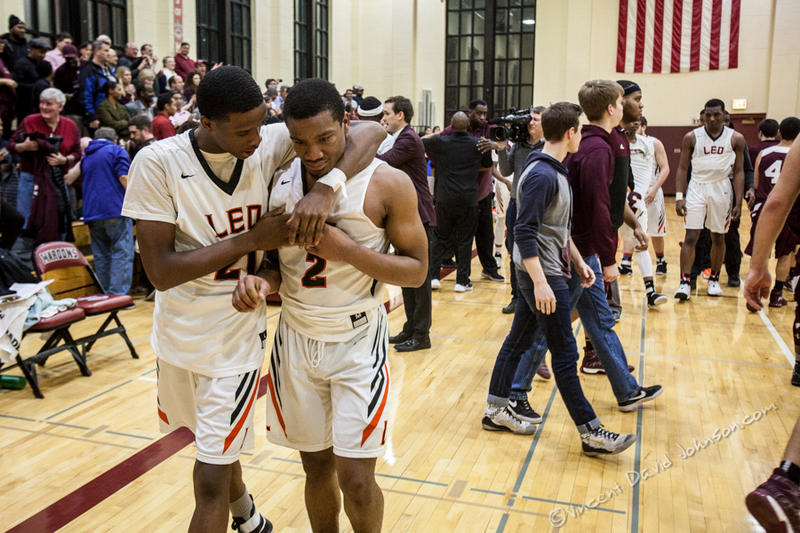 Leo’s Kevin Drumgoole, (left) tries to console Mario Pittman after their region final loss to U-High, Friday, February 24, 2017 in Chicago. (Vincent D. Johnson-Daily Southtown).